The stock price of the company's parent BofI Holding has notably lagged those of its rivals lately. After a considerable run-up in its stock price following the Great Recession, the popularity of Bank of Internet's corporate parent BofI Holding (NYSE:AX) has dimmed. 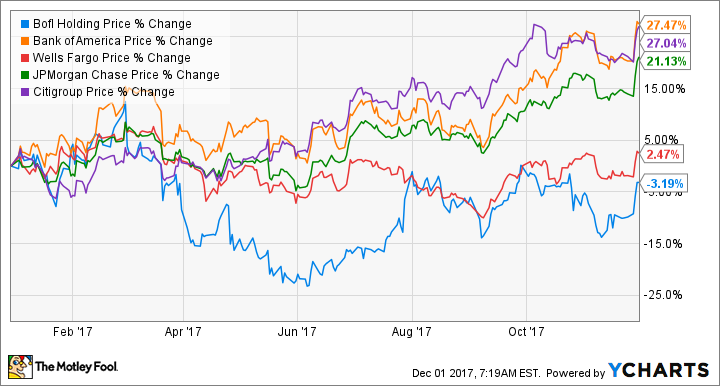 So far this year, BofI Holding's shares have significantly underperformed three of the "Big Four" banking stocks on the market. But this has made some of the stock's valuations more attractive than those of its big peers. That leads to the question of whether BofI Holding stock is currently a buy at its current levels, especially given the controversies that have dogged the company. Here's what I think. BofI Holding's stock price began its seesaw in late 2015, when a disgruntled former employee filed a lawsuit against the company for essentially violating laws related to whistleblowers. This prompted the Justice Department to launch an investigation into the bank's business practices; several outside lawsuits followed. Few investors are happy to see their company investigated by the federal government, so the stock unsurprisingly hit a rough patch. On top of that, short-sellers piled into BofI Holding, sensing an imminent share price dive. There is still much short interest in the stock -- 38% of share float, as of late October -- although that's declined somewhat in recent months. That might be due to the close of the Justice Department's investigation in June. Another factor likely at work is the company's performance, which continues to be impressive. The recently announced Q1 of fiscal 2018 met this standard, as attributable net income was 12% higher on a year-over-year basis at $32 million. That growth rate was almost as high as sector standout Bank of America in its most recently reported quarter. It is, however, lower than it's been in the recent past, which is probably also a factor dampening the stock price. Meanwhile, Bofi Holding's net loans and total deposits also expanded nicely, advancing by 15% and 14%, respectively (to $7.5 billion and $7.2 billion). Another negative in the eyes of some investors is the bank's heavy concentration in one area of lending, specifically mortgages and, more specifically, jumbo mortgages. All told, home lending comprised almost three-quarters of the company's overall loan portfolio. Regardless, BofI Holding continues to do a fine job of leveraging its great competitive advantage: its complete lack of physical branches. In certain American cities, it's impossible to travel much distance without bumping into a facility run by Bank of America, JPMorgan Chase, or Citigroup. Those are expensive to run and maintain, and they require a lot of salaried workers to staff them. That's why there's such a discrepancy in the cost bases of BofI Holding and its rivals. This is most starkly illustrated by these banks' efficiency ratios. BofI Holding's number is notably lower than those of its bigger brethren. Lower costs help the company nudge up the interest it pays on its deposits, which helps attract clients to the bank. Certain figures suggest that the company's stock is undervalued. Its return on assets and forward price-to-earnings ratio handily beat its three rivals. It was slightly outgrown on the bottom line by Bank of America in the respective latest reported quarters, but well outpaced both JPMorgan Chase and Citigroup. Its price to tangible book value ratio is a bit rich, but not excessively so. Data source: BankRegData.com, Yahoo! Finance, The Wall Street Journal. YOY = year over year. Investors should slowly start coming around to BofI Holding's stock. The short interest in the shares is dropping, the specter of a government investigation has evaporated, and the bank continues to put up solid numbers. Online banking will not only be a major part of the future for consumers but it's already here and generating growth for sharp operators -- most notably, this pioneering online-only lender.